GeneratorJoe, Industrial Natural Gas and LP Generators - Single Phase, 60 Hz and 50 Hz. - Sentry and Defender2 Series., NG/LP generators,�25,000 watts (25 kW) to 150,000 watts (150 kW). Engines from GM, PSI and others. 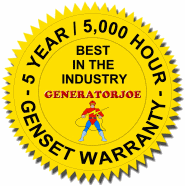 Largest online selection of Industrial Natural Gas &LP Generators from GeneratorJoe & Kohler. NG/LP generators, 25,000 watts (25 kW) to 200,000 watts (200 kW). Gaseous engines from GM, PSI and others. If you are looking for industrial NG/LP 1 Phase generators, this is the right page. For Three Phase NG/LP Generators. If you are looking for industrial diesel generators see these categories. Single Phase Diesel Generators from 9 kW to 150 kW. - Three Phase Diesel Generators from 30 kW to 3,250 kW. Mobile Diesel Generators 20 kW to 800 kW.